Adam Bunyard, Owner of Snappy Services. 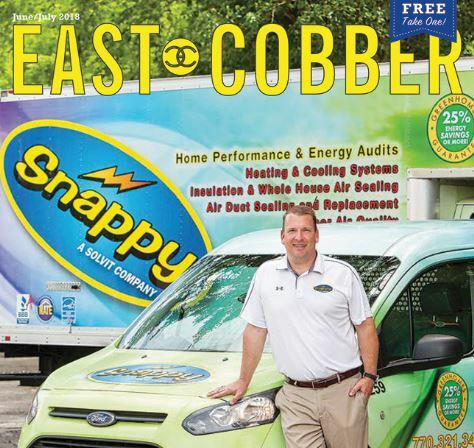 This month’s front cover features East Cobber Adam Bunyard, Owner of Snappy Services. Snappy Electric, Plumbing, Heating & Air is a local business that you can count on for all of your home repair and maintenance needs. Adam focuses on exceeding customer expectations with every repair and installation. Snappy offers services that include plumbing; electrical repairs; heating and air conditioning installation/ repair; air duct sealing; drain cleaning and home energy audits. Snappy is proud to separate themselves from the other large companies by treating their employees like family, providing exceptional customer service to local homeowners, and giving back to the community that supports them. For more information about this locally-owned and operated business, you can read their story on page 6 or visit snappyservices.com. Snappy is the one call you need to make for all of your home service repairs, installations, and other needs to create home comfort, safety and convenience. Call 770-321-3433 to schedule an appointment. Front cover photo taken by Michael Drewitz of Michael’s Photography. This article originally appeared in the June/July issue of the EAST COBBER magazine, on page 4. Click here to view the digital edition.